It is surprising that a simple everyday phenomenon like diffusion is occasionally not really understood even by scientists. So it is worth while talking about it with the aim to provide essential understanding without resorting to mathematics. "Diffusion = Substance transport without flow"
Diffusion is a main way of substance transport in mineral deposition, including flint and chert formation, and thus is essential for fossilisation. Geologists unfamiliar with the concept of diffusion did have a difficult job when trying to explain every mineral deposition with their favourite notion of "circulating solutions". Filling a cavity with a solid deposit would require an odd regime with repeated inflow and outflow of solutions. Since "circulating solutions" is a more vivid concept than diffusion, it has survived in minds and publications up to now. Redistribution of substances resulting in crystal growth is often ascribed to substance transport by liquids or fluids moving along fissures in hot rocks in the depth while diffusion as the main transport process is not even mentioned (as, for example, in the National Museum of Scotland, Edinburgh). Fig.1: Mineral aggregate in fossiliferous chert, Lower Permian, Döhlen basin, Saxony. What looks like a bizarre flower in the picture on the right is a mineral aggregate whose history can be reconstructed: Silica-rich swamp water turned into silica gel, decaying organic matter produced H2S which combined with dissolved iron compounds into insoluble FeS, which appeared as tiny cubic pyrite crystals suspended in the gel. The crystals grew as more sulfur and iron ions approached them by diffusion. Eventually the reducing environment turned oxidising, whereupon the pyrite slowly decayed into sulfate and iron oxides. The sulfate ions combined with dissolved Ca into gypsum, whose crystals, stained dark probably by iron oxides, grew immediately on the faces of the pyrite cube in this picture, which became replaced by chalcedony in the process. All this occurred without any flow of a solution. The "flower stalk", which is an old crack, could possibly have contributed to the transformations since cracks are easy diffusion paths. While fluid flows have a well defined velocity at any position and time, velocity is not a reasonable concept for diffusional flows. This is apparent from the fact that the time required for a substance to spread over a distance by diffusion is proportional to the square of distance. With a microbe 104 times smaller than a tea cup, any substance would spread throughout the microbe 108 times faster than throughout the tea. So it can be stated that substance transport by diffusion is slow over larger distances but very fast and efficient over very small distances. This is the reason why liquid flow systems had to be invented by living beings when they evolved from unicellular to big ones. It is the motion on the molecular scale which brings about substance transport by diffusion. This can be visualized by means of the following thought experiment, which could be performed in reality as well. Imagine a table with lots of little balls on it and with a rim along the edges so that they cannot roll off. Let there be red and blue balls, neatly sorted so that they occupy the left and right side of the table, respectively, separated by an imaginary line in the middle. By shaking the table violently, the balls get into random motion, bouncing from the rim and from each other, which is analogous to the thermal motion of molecules. This motion will gradually take more and more balls into the other half of the table until finally the red and blue ones are equally distributed. One can easily imagine that the mixing is quickest at the beginning when the concentration profiles of the red and blue balls are step-like, and gets slower as the profiles become smoothed. This is expressed more precisely by the statement that the diffusional flow is proportional to the concentration gradient. As an extension of this experiment, let there be light and heavy balls. The heavy balls would be slower on average. From statistical mechanics it is known that the average kinetic energy is the same for all, irrespective of weight. This means that water molecules move more than 4 times faster than the 19 times heavier sugar molecules, since the square root of 19 is about 4.3. Up to here, this may have seemed so simple to some readers that it has been boring. However, as some scientists may stumble already at this modest step of knowledge, it is formulated here once more in other words: The sugar molecules with their slow random motion move from the sweet tea below to the less sweet tee above, and the water molecules with their fast random motion squeeze themselves in between and occupy quickly the places where the sugar molecules have left. This has not been realized by M. Landmesser as he claims, in connection with silicification, that the solvent does not diffuse . Quite the opposite is true at some stage of silicification where the silica clusters become so big that they hardly move but the water molecules slip between them as quickly as ever. Even at the more advanced stage of silica gel, water is able to diffuse through the meshes. By neglecting the diffusion of water one would not be able to understand some details of the fossilisation process. Nevertheless, the work of Landmesser on silicification has been defended by R. Rössler as particularly thorough . Less obvious is the mechanism behind a peculiar feature of diffusion: The diffusional flow of substance through a hole in a sheet is not proportional to the area of the hole but to its diameter. This means that perforated sheets with equal total hole area but unequal hole sizes let more substance pass if the holes are small, which is quite essential in substance transport through biological membranes. For an explanation, one additional idea is required, a rough estimate of the concentration gradient of the diffusing substance at the hole. Since the diffusional flow diverges as it comes out of the hole, the concentration decays rapidly with distance there. As a reasonable assumption, the concentration is essentially diminished at distances about equal to the hole diameter d. This provides an estimate for the concentration gradient: concentration at the hole divided by d. Hence, small holes make steep gradients and thus high diffusional flow density. The flow or transport through the hole is flow density multiplied by hole area, and since the flow density is proportional to 1/d and the area is proportional to d2, the flow is proportional to d but not to d2 as in the case of fluid flow. Apparently this explanation of the phenomenon is not generally known among biologists. An encyclopedia of biology proposes an explanation based on the assumption that diffusion is concentrated at the circumference of the hole and therefore is proportional to the diameter. Furthermore, not even the experimentally established phenomenon itself is generally known among scientists who work on diffusion in plants. Theoretical results on diffusion through perforated walls offered as elaborate formulae can be easily checked: If they contain the total area of the holes but not the hole size, they cannot be right. 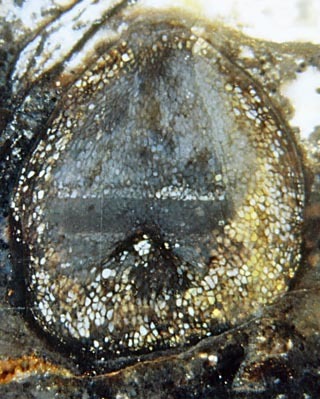 Fig.2: Corm of the Lower Devonian plant Horneophyton with level bands resulting from silica cluster suspensions pervading the tissue by diffusion probably through holes in the degraded cell walls. Three pictures illustrating diffusion effects in chert are explained in Permian Chert News 13. M. Landmesser: Zur Entstehung von Kieselhölzern, extraLapis No.7 (1994), 49-80. R. Rössler: Der versteinerte Wald von Chemnitz. Museum f. Naturkunde Chemnitz 2001, p.198.